We present a line of traditionally beautiful candles, appreciated by connoisseurs throughout the world. Hanukkah is a Jewish holiday commemorating the rededication of the Holy Temple (the second Temple) in Jerusalem at the time of the Maccabean revolt against the Seleucid Empire. Hanukkah is observed for eight nights and days, starting on the 25th day of isle according to the Hebrew calendar, which may occur at any time from late November to late December in the Gregorian calendar. It is also known as the festival of lights and the feast of dedication. 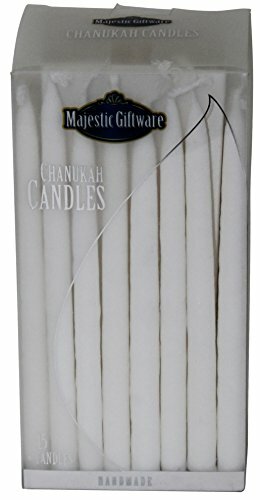 The festival is observed by the kindling of the lights of a unique candelabrum, the nine-branched menorah (also called a Chanukah/Hanukah), one additional light on each night of the holiday, progressing to eight on the final night. The typical menorah consists of eight branches with an additional visually distinct branch. The extra light, with which the others are lit, is called a Shamash (Hebrew: שמש‎‎, "attendant") and is given a distinct location, usually above or below the rest. other Hanukkah festivities include playing deride and eating oil-based foods such as doughnuts and latkes. Since the 1970s, the worldwide Chabad Hasidic movement has initiated public menorah Lightings in open public places in many countries. If you have any questions about this product by Majestic Giftware, contact us by completing and submitting the form below. If you are looking for a specif part number, please include it with your message.